Healmagz.com - We may unconsciously usual snore during sleep. For ourselves it may not be too intrusive, but for couples or friends sleep is very disturbing. Even according Otolaryngologis and snoring from Capital ENT Specialists in Austin, Texas, United States Daniel P Slaughter, MD, snoring can also cause the real problems in the marriage. Snoring is not just an unpleasant habit, but it can be a serious health problem for the partners of those who are snoring. Snoring has been considered as a little discomfort, but today it is something that should not be ignored. Doctors will say that the snoring is a sign that something is wrong. The snoring occurs when the airways of the person who sleeps are tightened, so that the air that passes through them irritates the soft tissue of the throat. In order to stop this process you have to lose weight. The overweight can add new tissue to the neck and also to press and narrow the airway, which lead to the vibrations that cause the snoring. Maybe you have noticed that this night “activity” started when you became obese. With the loss of the weight, you will achieve other benefits. Nothing makes more pressure on the throat than lying on your back. That is why if you sleep aside, you can lower the snoring. Most of the people who sleep on their back are snoring. 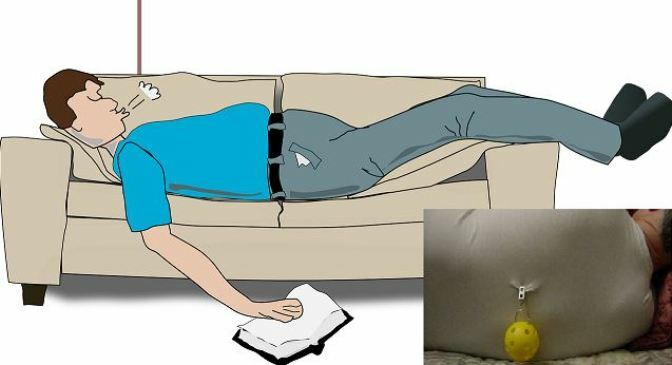 To stop sleeping on your back you have to do the following: cut one piece of an old shirt and wrap a tennis ball in it. Then you have to sew it on the back of your pyjamas. The ball will cause discomfort, and it will force you to change the sleeping position. Maybe you have to try with more pillows. Try to put more pillows under your head, in order to open the airways. By doing this the throat will not close and you will not start snoring. If you cannot sleep on high pillows, then you can put something under the legs of the bed, in order to left the side where your head is. If snoring is caused by clogging of the nose, or of some allergies, then the snoring can become worse if the air is dry. Sleeping with air humidifier, can be useful. This causes excretion of mucus from your sinuses which help to purify the airway, and the snoring is reduced. There are also home remedies that can also help you. For example the olive oil which can help you if you drink one tablespoon before sleeping. Apart from the olive oil, the ginger can help you. You will need a few slices of ginger. Overflow them with one cup of hot water, and boil it for 5 minutes. Strain the liquid and add one tablespoon of honey. You can drink it several times a day. This process can cause health risks. The snoring can cause a risk of pneumonia. The pneumonia is more evident at people who are snoring. It causes temporary blockage of the upper airway and thus stops the flow of oxygen. The risk of inflammation of the lungs can be related to many other health problems such as: heart disease, diabetes or dementia. Snoring is running the concentration. This is applied to persons who are engaged in work that requires full concentration throughout the working day. According to one study the snoring is related to the risk of stroke and arrhythmia’s. Here we have narrowing of the arteries in the neck to the fatty deposits. People who are snoring have an irregular heart rhythm what is called arrhythmia’s. However, people who have this problem at night should consult with a doctor, in order to prevent it on time. The snoring or sleep apnea is reducing the oxygen levels in the blood and mot regular heart rhythm.